Do you need to reset a Windows 10 password? Microsoft doesn’t make it easy to reset Windows 10 passwords when they are lost or forgotten. That is important to keep unwanted users off your computer. Below I give you the steps that show how to perform a Hirens Boot CD password reset on Windows 10. You can use either a CD/DVD or USB flash drive. I’ll show you where to get the files and download them for free, and show you which ones you need for your case. This method works on Windows 10 and 8. If you need to do it on an older version of windows, there is a link below for that too. 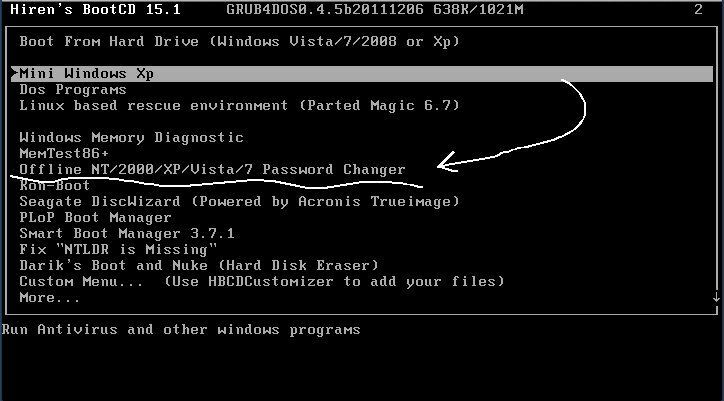 We have an older article that will help you if you are looking to reset a password on Windows 7, Windows XP, Windows Vista, and even Windows 8. As I’ve said before, Hiren’s BootCD is an excellent utility that you can create on CD, DVD or USB. Read on to find out how to enable this password reset method. First of all, you’ll need the Hiren’s boot CD software. If you want to set up a CD iso download it here (scroll down to the download button at the bottom). When the zip file has downloaded, double-click the file to extract it. You will then need to burn the ISO file to a writable CD. 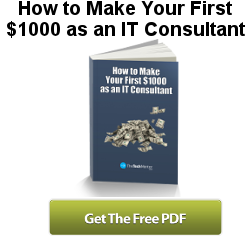 For this you can use programs like ‘Free ISO Burner’ (or ImgBurn and many more – perhaps you already have suitable software). If creating ISO versions are annoying to you, or your laptop doesn’t have a CD player, then you will need to put it on a USB. It is possible and it’s much better these days as every machine will have a USB port. It’s probably easier too. To create a USB boot up version you will need to download the USB Alternative as an executable file (opens in a new tab – this is handy as it has the details on setting up your USB). This will ensure you copy the content and manage the USB drive properly. So, just to be clear: you need Hiren’s BootCD PE – ISO2USB if you want to use boot from a USB, and Hiren’s BootCD PE x64 if you are going to create a boot CD/DVD. Warning: Be certain you use a new or blank USB as you will lose everything on one that has data on it. The process includes a reformat and the USB will lose any partitions. Note: you will need to set up either the bootable CD or USB on another computer. Yes I know this is probably obvious, but I suppose it doesn’t hurt to point it out. With the CD version, put it into the computer that needs its password reset and boot from it. You will likely have to change the computer’s boot order in the BIOS in order to boot from the CD. Note: When using the USB or flash drive version, you will only see USB options in the list of devices. Windows PE is for deployment and recovery, in other words it is the mini XP for Windows 10. When you boot from the CD, you will see a Hiren’s boot menu, a little like the one below. Move down to “Offline NT/2000/XP/Vista/7 Password Changer” (using the arrow key) and press enter. Note, if you have an older version of Windows, you can use Mini Windows XP as first highlighted. As I state above, this is the deployment and recovery version for Windows 10. Note: As is written on the screen, Don’t Panic! Several lines of text will roll up the screen, which may be a little disconcerting the first time you see it. If more than one partition is identified, it will prompt you to select the one (disk) where Windows 10 is installed. Note: Windows 10 installation normally takes up around 30 GB (ie. 30k MB) – that might help you identify its partition. If prompted, type the number corresponding to the Windows partition on the screen. I expect most PCs will have the default path as Windows/System32/config. For most PCs you can just hit <Enter>. You can just press <Enter> again, because it is the ‘password reset’ option we need. You will have a few options at this point to select the user account that needs its password reset. The user accounts will now be displayed and usually include Administrator and Guest in addition to the users normal set name, which you (or they) should easily recognise. Type ‘Administrator’ and press <Enter>. In your case it’s you or your client’s username. Type the username from the list and press <Enter>. Type ‘1’ and press <Enter> for the default option ‘Clear (blank) user password’, as this is the actual step that will reset a password in Windows 10 by Hirens boot CD *. You should get feedback that it is successful, ‘Password cleared’. Note: * You will need to save the changes as you exit. Press ‘q’ and hit <Enter> to commence quitting the main menu. Note: Yes you can write a new password rather than clear it. You will be prompted to save changes. Hit the ‘y’ key for yes (and press <Enter>), and your password reset will be saved (ie. the password is saved as clear). You are now ready to reboot the machine. Remove the CD or USB, and then restart. You or the user can now log into the computer without a password. Awesome! 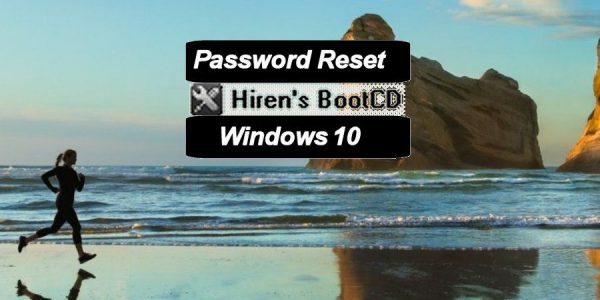 You’ve done a Hirens boot CD password reset in Windows 10! First you chose whether you wanted to use the CD or the USB version. Remember to make sure you use a blank USB when using the USB version or one that you don’t mind to reformat and lose any data on it. It’s a great utility that I recommend elsewhere on TheTechMentor.com. Download the appropriate file from the CD or USB link above and install. Follow the steps above that show how to perform a Hiren boot CD/USB reset password in Windows 10.